Already have a Username/Password for Russian Journal of Linguistics? Preparing the manuscript, authors are kindly requested to adhere to the following guidelines. These guidelines are prepared in accordance with COPE (Committee on Publication Ethics) guidelines, ORI (the Office of Research Integrity), CSE (Council of Science Editors) and EASE (European Association of Science Editors) guidelines. Length of the manuscript from an original study, lecture or literature review (including tables and list of references) should exceed 6000-9000 words. Short reports and letters to the editor should not exceed 1500 words. Please consult the MS Word built-in statistics service prior to submission in order to find out the exact length of your manuscript. Should your manuscript exceed the aforementioned limits, the editorial board will carry out the final decision on its publication based on recommendations from your reviewer. Text formatting. Lettering in Times New Roman is preferable in all cases (font size 12 pt with 1.5 line spacing and 2 cm margins). Kindly refrain from using underlining in your document (italic and bold formatting is acceptable). Abstract of an original study should start with some brief background information and statement of the study’s AIMS, followed by MATERIALS & METHODS and finishing with the RESULTS. The closing sentence should outline the main CONCLUSIONS of the study in the most comprehensible terms. Please note that your abstract should be 200-250 words. Choice of keywords. 6 to 8 keywords are preferable. The reference list should be on a new page, double spaced, and use the hanging indent method (all lines after the first one are indented). The reference section should contain all works referred to in the text, and only those. Number of references is no less than 30. Within the body of the text references should be provided in in "Author-date" format: (Wierzbicka 2003: 23) or (Brown and Levinson 1987) or (Wierzbicka 2003, Brown 2006). A complete list of all authors should be presented in every bibliographical entry. Do not shorten titles of your citations. They must be listed fully in alphabetical order of author/editor, with complete bibliographical details (including publisher). First name of authors is required. Journal and book titles must be given in full and must be printed in italics. Page references must be given for articles in books and journals. Reference entries for multiple works by the same author/editor should be listed chronologically, with the oldest publication at the top and the newest at the bottom. If no DOI has been assigned to the content, provide the home page URL of the journal or of the book or report publisher. Do not insert a hyphen if you need to break a URL across lines; do not add a period after a URL, to prevent the impression that the period is part of the URL. In general, it is not necessary to include database information. Do not include retrieval dates unless the source material has changed over time. Wierzbicka, Anna (1999) Emotions across languages and cultures: Diversity and universality. Cambridge: Cambridge University Press. Gregory, Gayle, & Parry, Terence (2006) Designing brain-compatible learning (3rd ed.). Thousand Oaks, CA: Corwin. Kecskes, Istvan (2007) Formulaic language in English Lingua Franca. In Kecskes, I. & L. Horn (eds.) Explorations in Pragmatics: Linguistic, Cognitive and Intercultural Aspects. Berlin/New York: Mouton de Gruyter, 191–219. Kecskes, Istvan (2008) Dueling context: A dynamic model of meaning. Journal of Pragmatics, 40 (3), 385—406. Vennemann, Theo. (2000a) From quantity to syllable cuts: On so-called lengthening in the Germanic languages. Journal of Italian Linguistics, 12, 251—282. Vennemann, Theo. (2000b). Triple-cluster reduction in Germanic: Etymology without sound laws? Historische Sprachwissenschaft, 113, 239—258. Note: Titles in languages other than French, German, Spanish and Italian should be translated into English. The translation should appear in roman, and should be placed in square brackets directly following the original title. Reduce graphical material to minimum (unless the nature of your study dictates otherwise). Photographs should be rich in contrast, illustrative artwork should be clear and of high resolution (dpi). Cover letter. The journal editorial board requires authors to submit a scanned copy of a cover letter from authors team in *.pdf format. We expect a cover letter to summarize concisely why your paper is a valuable addition to the scientific literature and briefly relate your study to previously published work. Cover letter should be signed by all of your co-authors. We accept separate letters from authors if they have different affiliations declared in the manuscript. * You are also welcome to include additional information you would like to share (e.g. the number of publications, membership in academic associations and editorial boards of journals, etc.) but within the word limit. List of references should be organized according Harvard guidelines in APA Style. For detailed instructions on bibliographic formatting, see «References list guidelines». Completing submission. Please check the list of attached files prior to finishing the procedure. Within next 7 days, the editorial board will inform you by e-mail of receiving submitted materials. Feel free to contact the editors or the reviewers should you have any questions regarding the processing of your manuscript. Accessing your personal account on-site will allow you to monitor its progress online. Absence of plagiarism. The submission has not been previously published, nor is it before another journal for consideration (or an explanation has been provided in Comments to the Editor). Correct manuscript format. Manuscript file format is Microsoft Word (has the extension *.doc, *.docx, *.rtf). The text adheres to the stylistic and bibliographic requirements outlined in the Author Guidelines, which is found in "For Authors" section. The right of authorship belongs to the authors of articles. The authors transfer the rights to use the article (including the use and distribution of an article in the Open Access) to the publisher of the journal on a non-exclusive license (Publishing Agreement (Public Offer)). At the same time, authors remain full rightsholders. The Federal State Autonomous Educational Institution of Higher Education "Peoples’ Friendship University of Russia” (RUDN), represented by the Vice-Rector for Scientific Work Nur Serikovich Kirabaev, acting under a Power of Attorney dated № 44-09/16-144 от 27.07.2016 г., hereinafter referred to as the Publisher, on the one hand, hereby offers to the public at large, hereinafter referred to as the Author, on the other hand, hereinafter collectively referred to as the Parties, to enter into this agreement, hereinafter referred to as the Agreement, regarding publication of scholarly materials, hereinafter referred to as the Article, in the Journal named 'Russian Journal of Linguistics', hereinafter referred to as the Journal, under the following terms. 1.1. Pursuant to Clause 2 of the Article 437 of the Russian Federation Civil Code, this Agreement shall be recognized as the public offer, hereinafter referred to as the Offer. Subject to Article 438 of the Russian Federation Civil Code, this Offer shall be deemed to have been completely and irrevocably accepted after the Author had submitted his/her materials by uploading those onto the network electronic system of the article acquisition for review available at the respective section of the Journal's site at URL: http://journals.rudn.ru/index.php/linguistics/author/submit/1 on the Information and Communication Network known as the Internet, hereinafter referred to as the Internet. 1.2. Pursuant to the Russian Federation effective law as applicable to compliance with the copyright to electronic information resources, no materials from any site, electronic journal or project may be reproduced, in whole or in part, in any form, either in a hard or soft copy, without a prior consent from the Journal's authors and editorial staff, which may be expressed by posting a respective consent (open license Creative Commons Attribution International 4.0 CC-BY) in the relevant section of the Journal's site on the Internet. Whenever any published materials are used within the context of other documents, a reference to the original source needs to be specified. 1.3. The Journal is registered by the Federal Oversight Service for Communications, Information Technologies and Mass Communications (RosKomNadzor). The Author is an individual (or individuals) whose creative labor has produced the Article. The Offer Acceptance means a complete and irrevocable acceptance of the Offer under the terms specified in Clause 3 hereof (the Author accepts the Offer by submitting an application to the Publisher, i.e. 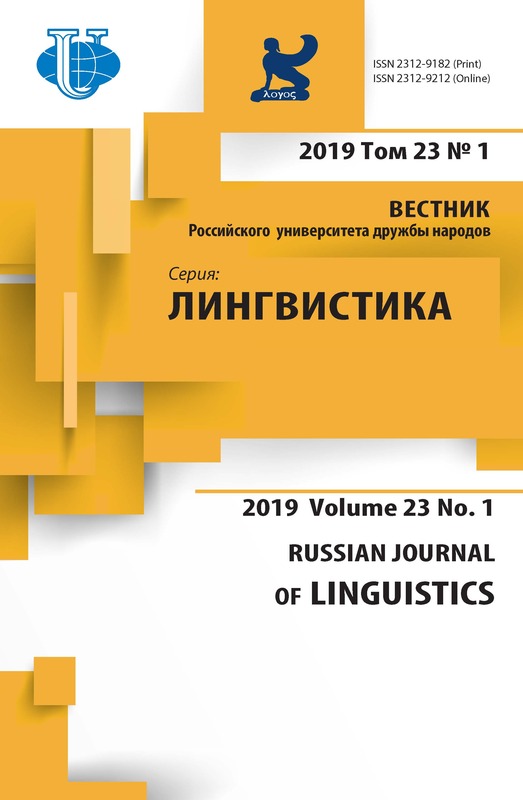 by uploading the Article along with support materials onto the network electronic system of the article acquisition for review available at the respective section of the Journal's site at URL: http://journals.rudn.ru/index.php/linguistics/author/submit/1 on the Internet). The Journal means an academic periodical named 'Russian Journal of Linguistics'. The Application means an electronic request of the Author addressed to the Publisher for publishing the Article in the Journal by uploading the Article and support materials onto the network electronic system of the article acquisition for review available at the relevant section of the Journal's site at URL: http://journals.rudn.ru/index.php/linguistics/author/submit/1 on the Internet). The Publisher is the Federal State Autonomous Educational Institution of Higher Education "Peoples’ Friendship University of Russia” (RUDN), being the Journal's founder and publisher. The Article's Metadata means any materials in Russian and English intended to be included into the Science Citation database as per the original version of the Article such as the Article title; authors' details (full last name, first name, patronymic, present employer of each author with indication of the postal code, contact details (e-mail) of each author; abstract; keywords; topical classifications: UDC or any other bibliographic and library classification, and subject indices; bibliography (list of references). The Offer means this document (offer to the Author) to publish an Article by uploading it onto the site at URL: http://journals.rudn.ru/index.php/linguistics/author/submit/1 on the Internet. The Publication means the act of publishing the Article in the Journal. The Journal's Editorial Staff means a creative team engaged in preparing the Journal for publication. The Editorial Board is an advisory body of the Journal's Editorial Office. The Article means a result of fundamental and applied scholarly efforts in the form of a scholarly material, scientific review material, scientific message, bibliographical review on specific topics of the scholarly study, and background information on Russian and foreign scientists submitted by the Author for publication in the Journal. The Parties mean the Author and the Publisher. The Article Requirements mean requirements to the materials published in the Journal's section named "To Authors" of the Journal's site at URL: http://journals.rudn.ru/index.php/linguistics/about/submissions#authorGuidelines on the Internet. The Service means publication of the Article in the Journal as per the Author's application. 3.1. Subject to this Agreement, the Author shall provide the Publisher at no expense for the copyright duration as stated by the Russian Federation legislation with a non-exclusive license for use of the Author-created Article for the purpose of its publication in the Journal. any other rights, not expressly assigned to the Publisher hereunder, including patent rights to any processes, techniques or methods, and other means, described by the Author in the Article, as well as trademark rights, shall be retained by the Author. 3.3. No territorial restrictions will be applied to the use of rights to the Article. 3.4. This Agreement shall become effective from the time the Article is submitted to the Journal, i.e. uploaded along with support materials onto the network electronic system of the article acquisition for review available at the relevant section of the Journal's site at URL: http://journals.rudn.ru/index.php/linguistics/author/submit/1 on the Internet, hereinafter referred to as the Article Upload. 3.5. The rights shall be assigned by the Author to the Publisher at no expense, and the Article publication in the Journal shall not result in any financial contribution to the Author. 3.6. If the Publisher decides to refuse to publish the Article in the Journal, this Agreement shall cease to be in force. A decision to refuse publication shall be sent to the Author via the e-mail address specified in the Application. 3.7. The Publisher undertakes, throughout the currency of this Agreement, to provide to the Author the services associated with publication of the Article on the Journal's site at URL: http://journals.rudn.ru/index.php/linguistics on the Internet. the Author Accepts the Offer. 4.2. The services shall be provided to the Author free of charge. 4.3. If any materials submitted by the Author are found in breach of rules and requirements of this Offer, the Publisher shall have a right to refuse to publish those. 4.4. The Publisher shall not be responsible for any third-party unauthorized use of the data provided by the Author during the currency of this Agreement. the Author has advised other Co-authors of the terms of this Agreement and has received consents from all the Co-authors to conclude this Agreement under the terms hereunder. make only such edits in the proof that are minimally required to correct errors made in the Article original and/or introduce factual and momentary changes. pass to any third party a soft copy of the published Article provided by the Publisher pursuant to Clause 5.4 hereof for the Article to be incorporated, in whole or in part, into a scientific information database or repository in order to promote academic or scholarly investigations or for informational and educational purposes subject to the Author, Journal and Publisher being properly referenced. respect the Author's rights established by the effective law, protect those and use best endeavors to prevent any copyright infringements by third parties. introduce changes to the Offer as per the procedure established by the Offer. 5.6. Unless otherwise provided or stated herein, the Parties shall refer to the effective legislation of the Russian Federation. 6.1. This Agreement shall become effective when concluded, i.e. when the Author Accepts the Offer by sending an application to the Publisher, that is, by uploading the Article (Article Upload), and remain in effect for five years. 6.2. The Offer Acceptance constitutes an Agreement made in writing (Articles 438 and 1286.1 of the Russian Federation Civil Code) under the Offer terms. 6.3. Unless any of the Parties sends to the other Party a written notification of the Agreement termination no later than two months prior to the end of the specified five-year period, the duration of the Publisher's copyright to the Work shall be automatically extended by the similar period. The number of extensions is not limited. 6.4. The term of the Agreement may not exceed the duration of exclusive rights to the Article pursuant to the Russian Federation legislation. 6.5. Whenever the Author assigns (disposes of) its exclusive rights to the Work to any third party, this Agreement shall remain in effect. 7.1. The Publisher shall have a right to unilaterally modify the terms of this Agreement by giving a prior notice to the Author, at least ten (10) calendar days before such modifications become effective, to the Author's e-mail address specified in the Author's application or via the Journal's site. These modifications shall become effective from the date specified in the respective notice. 7.2. If the Author disagrees with any modification in the terms of this Agreement, the Author shall have a right to submit a written notice of his/her withdrawal from this Agreement by uploading it onto the network electronic system of the article acquisition for review, available at the relevant section of the Journal's site at URL: http://journals.rudn.ru/index.php/linguistics/author/submit/1 on the Internet. 7.4. The Author shall have a right to cancel this Agreement unilaterally by sending the Publisher a respective notice in writing at least sixty (60) calendar days prior to the intended date of the Author's Article publication in the Journal. 7.5. The termination of this Agreement for any reasons shall not release the Parties from responsibility for breach of any Agreement terms during the currency hereof. 8.1. A Party which has failed to perform its obligations under this Agreement, either in full or in part, shall be held liable pursuant to the Russian Federation legislation in force. 8.2. All the data provided by the Author shall be trustworthy. The Author shall be responsible for completeness and reliability of the data provided to the Publisher. The use of untrustworthy information obtained from the Author shall not entail any responsibility upon the Publisher for any adverse effects resulting from its actions based on such untrustworthy information. 8.3. The Author shall take full personal responsibility for compliance with the requirements of the Russian Federation law on advertising, protection of copyright and related rights, protection of trademarks and service marks, and protection of consumer rights. any loss incurred by the Author whether or not the Publisher was in a position to predict such loss. 8.5. The Publisher shall be relieved from any responsibility for non-compliance with the terms of this Agreement if such non-compliance is a result of a force-majeure event such as an act of state authorities, including adoption of legal instruments, fire, flood, earthquake, other natural calamities, loss of power and/or computer network failure, strikes, civil commotions, riots, and any other similar events. 9.1. Any disputes and disagreements shall be resolved by the Parties by negotiations, and if the Parties fail to reach an agreement, these shall be resolved in accordance with the effective law of the Russian Federation. 9.2. If any disagreements remain unresolved, the Parties shall settle those at the location of the Publisher in accordance with the effective law of the Russian Federation. 10.1. Any notifications, messages, requests etc., excluding documents which need to be forwarded in original form pursuant to the Russian Federation legislation, shall be deemed to have been received by the Author, if delivered (sent) by the Publisher via the Journal's site, including by publishing those, by fax or e-mail specified in the Application, or using other communication facilities. The Parties acknowledge validity of notifications, messages, requests etc. delivered (sent) using the above-listed methods. reimburse the legal cost, expenses and loss incurred by the Publisher as a result of application of a pre-award relief and measures for execution of a judgment, and damages paid by the Publisher to any third party for the infringement of exclusive copyright and/or other intellectual property rights, as well as other expenditures incurred by the Publisher as a result of infringement by the Author of any warranties provided hereunder. 10.3. Subject to Article 6 of the Federal Law On Personal Data No. 152-FZ dated July 27, 2006, for the period from the conclusion of this Agreement and until the discharge of Parties obligations hereunder, the Author expresses his/her consent to processing of the following personal data by the Publisher: last name, first name, patronymic; taxpayers identification number (TIN); place and date of birth; citizenship details; ID document details; registration and actual location address; e-mail address; mailing address with postal code; contact phone numbers; fax numbers; and details of the employers. 10.4. The Publisher is entitled to process the above personal data for the purpose of this Agreement performance, including for provision of information and reference services to the Author. The processing of personal data shall be understood to mean any handing (operations) with personal data, including collection, systematization, accumulation, storage, refinement (update, alteration), use, distribution (including transfer to third parties), depersonalization, blocking and deletion of personal data in accordance with the effective Russian Federation legislation. 10.5. Where permitted by the Russian Federation legislation, the Author is entitled to withdraw his/her consent to processing of personal data as listed in Clause 10.3 by forwarding a respective notice to the Publisher. Upon receipt of such notice, the Publisher has a right to suspend services. 10.6. The Author will, on a goodwill basis, submit his/her details (and details of each Co-Author subject to their prior consent) to the Journal's Editorial Office consisting of his/her: last name, first name, patronymic, academic rank, academic degree, job title, employer details (name and mailing address), work phone number and e-mail address for the purpose of its general publication in the Journal along with the Article. TIN 7728073720, CRR 772801001, PSRN 1027739189323.